Sperm whale carcass is a rare site worldwide. Imagine the surprise when one drifted onto a remote reef in Gorontalo! 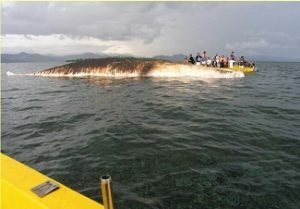 In early May, Miguel’s Diving staff received word that a mysterious whale had died in west Gorontalo. As a result, we made a whirlwind trip to its remote location. We were not the only curious people wanting to get a close look. The dead whale had washed onto a shallow reef about twenty minutes from shore. Enterprising boatmen were already providing transport for a fee to curiosity seekers. That included us! At first glance, Miguel’s Diving staff knew immediately that the attraction was a sperm whale carcass. It was in about one meter of water. It was laying on its side, barely floating on top of the shallow reef. We estimated its length to be 12 meters. The sperm whale carcass was in an advanced state of decay. This gave real meaning to the phrase “bloated whale.” The smell was horrific! Evidently, ocean currents had brought the dead whale into shallow waters where it got stuck. Miguel’s Diving already has close relationships with marine scientists. This include Indonesian Cetacean Watch. We knew that a specimen from the sperm whale carcass would be of great interest scientifically. However, retrieving a sample was easier said than done. Only sperm whales have the distinctive, large head that contains a special organ. It is called spermaceti. This is a massive organ composed of web-like pipes filled with a yellow wax. Centuries ago, this wax was harvested for fuel, mostly used in lamps. Very small waves were washing onto the Gorontalo reef and the dead whale. Underneath the skin of the whale’s head, the liquid inside was also washing back and forth. Any perforation of that skin would result in tons of putrefied spermaceti wax to gush out from the opening. To complicate matters, the boatmen only had a small knife on board. We expected a machete. The water surrounding the sperm whale carcass was clearly contaminated with rotting fluids secreted by the corpse. Fortunately, the water near the head was clearest. With knife in hand and wearing only a dive mask, Miguel Diving’s intrepid dive master jumped in. He literally swam between the jaws of the sperm whale. Taking a small chip of jawbone, he was out again in no time. Back at the village, a long wash with lots of soap and shampoo successfully prevented infection. NOTE: Researchers received the specimen in good order. Tests confirmed that the sperm whale (Physeter macrocephalus) had been female. More significantly, this was the first confirmation of this whale’s presence in Tomini Bay, Sulawesi. We were also told that sperm whales most often die in combat with deep-sea squid, their favorite meal. Although local fishermen had never seen a sperm whale, Miguel’s Diving boatman Sahir had seen one swim under his small fishing boat in the Togian Islands where he was raised. Sperm whales have a very distinctive head and jaw. The lower jaw has a row of conical teeth that can weigh up to a kilo each. When our intrepid dive master swam down to inspect the jaw, he discovered that local Bajo fishermen had already removed the teeth. Miguel’s Diving staff can practically guarantee that guests will not see a sperm whale carcass. To enjoy diving the beautiful waters of Gorontalo, please book your dive trip with us.